ScreenSteps Desktop 2.9 and Workgroup DocumentationScreenSteps Desktop & WorkgroupScreenSteps: Tips & Tricks AnnotationsHow Can I Start A Sequence Annotation On a Number Other Than 1? By default the Sequence annotation always starts on the number 1 for each step. Starting with version 2.6 of ScreenSteps you can set what number Sequence annotations should start on for any given step. 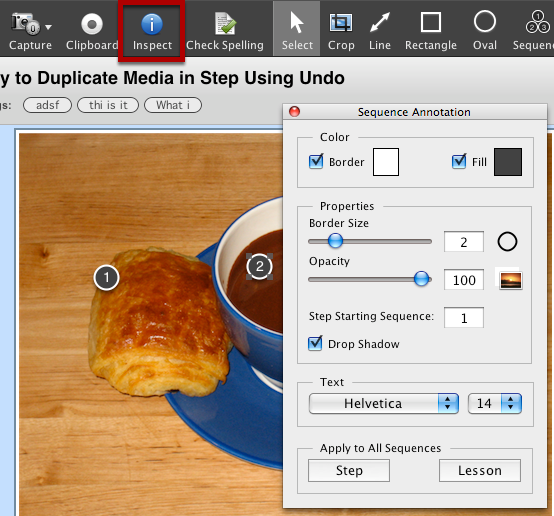 With the Sequence annotation selected open the inspector palette. You can double-click on the Sequence icon in the toolbar or click the Inspect button to open the inspector. 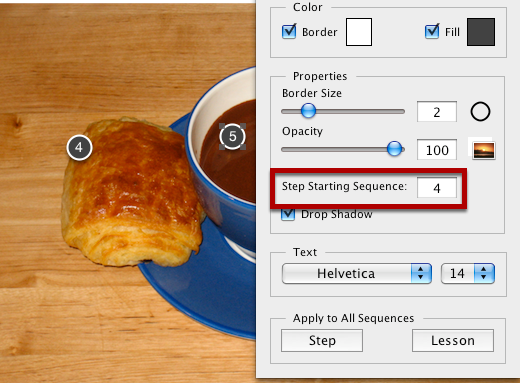 Change the Step Starting Sequence to the number you would like the first Sequence annotation to start on. In this example I am using 4.